From tomorrow, the King’s Road will have a new addition to its eclectic offering. PopUp Britain, the retail arm of StartUp Britain, is opening a flagship store, with the aim of helping online businesses who want to test their products on the high street. A former electronics showroom (which has been empty for three months) will host up to 12 start-ups at a time, each paying £200 for a two-week trial, to cover costs. It’s hoped that the scheme will give small enterprises and start-up retailers the chance to experiment with physical retail space, test the market and gain vital face-to-face customer feedback without burdening them with the usual long-term contracts and high rents of setting up a shop. Some of the first brands to pop into the new shop include Clicloc watches by Londoners Obi Nwosu and Brian Downer; rain-proof ponchos by Muswell Hill mums Rain-Wave; chocolates from The Cocoa Mistress; and sustainable, hand-crafted shoes by Pinucci London. 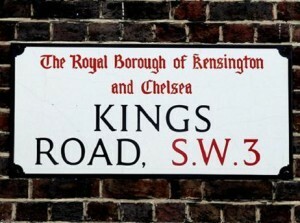 The King's Road opening is part of an initiative to match online retail start-ups with empty high street stores. This latest shop follows a pilot scheme in Richmond last year. There, a former estate agent which had been empty for a year, housed more than 60 start-ups in five months, with 91% reporting that the experience was good for business. StartUp Britain co-founder Emma Jones says, “Most online retail start-ups realise that in order to build a solid brand, they need to be offline in bricks and mortar as well as creating a good online presence. Our shop in King’s Road is designed to give start-ups a low-cost opportunity to test their products in an area that has famously played a key role in supporting independent British brands for decades." Below is a taster what went on in the PopUp Britain shop in Richmond during London Fashion Week last year.